Bronsted-Lowry acidity is a special case of Lewis acidity. In Lewis acidity, an electron donor shares electrons with an electron acceptor, forming a bond. In some cases, the electron acceptor is a proton. If the proton accepts electrons from the donor, but does not relinquish its bond to its previous partner, the interaction is called a hydrogen bond. Use curved arrows to show the proton transfer reaction between the following compounds. 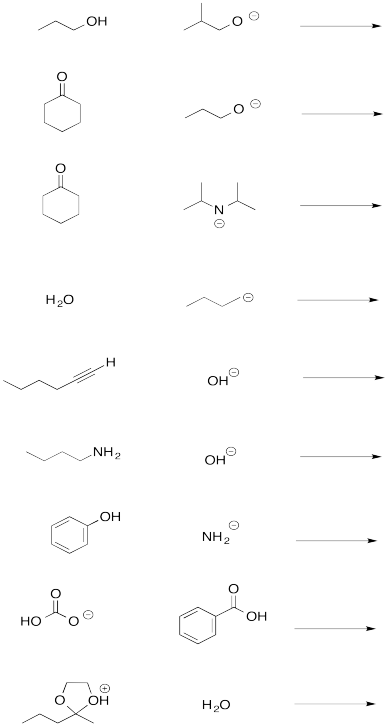 Predict the products for these proton transfer reactions. Use pKa to determine whether each reaction is reactant favored OR mixture OR product favored.